The collection is comprised of rare commemorative medallions and medals of honour, plaques, as well as military medallions and state medals of all categories, Greek and international. The oldest medals (end of the 17th Century) are from the period of the Venetian-Turkish Wars in Greece. Many of the medals of the collection have been created by well known Greek and European sculptors like, G. Iakovidis, M. Tombros, V. Falireas, David d/Angers, K. Lange, et al. Of particular importance in the collection are the first medals struck by the newly created Modern Greek State, known as Aristeia. Of particular interest from the later period are the medals instituted to honour the heroes of the Balkan Wars (1912-1913), the Asia Minor Campaign (1919-1922) and those of the War of 1940. 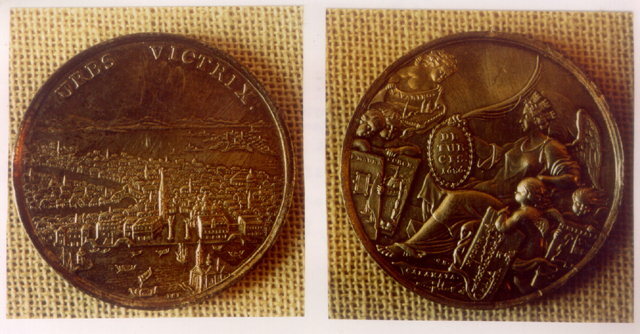 Silver medal, commemorating the clash for the annexation of Athens and the Peloponnese between the Venetians and Turks in Turkish occupied Greece (1684-1687). On the front, a panoramic view of victorious Venice. Work of the German engravers G. Hautch, L. and G. Lauffer, Vienna end of the 17th Century.